Just prior to its release we had a quick chat with Michelle Robinson who was the “Character Look Development Supervisor” for the movie. Michelle has a long history with Disney Animation and has worked on some of their best films including Bolt, Tangled, Zootopia, and Frozen. TCF: My first question is one you’ve probably had a lot today: What exactly does a Look Development Supervisor do? Michelle Robinson: So when the studio designs a character, they start with drawings. Then once they’ve kind of narrowed in on that, it becomes a 3D model. Someone sculpts that in the computer. But the 3D model still doesn’t have any texture or color or anything on it. So when it comes into our department, we’re the ones that paint it. We paint the skin to look like skin and we make the clothing look like cloth and we sort of differentiate all those materials. And then we also add the hair or fur, as the case may be. TCF: Do you get to pick any personal details to put into these characters or is it mostly just bringing the artists vision to life? Michelle: It’s mostly bringing the vision of the collective filmmakers to life. But I think we’re always looking to plus everything down the line. Everyone is encouraged to offer suggestions, come up with some creative ideas. We talk about the idea of authorship a lot. You know, what kind of authorship can you bring to this? And it really is about personal contribution, too. That’s one of the great things about doing this work is you’re often surprised by what people come up with and it can be really exciting. TCF: Do you have any examples of ideas you or your team have contributed or authored? Michelle: With the character Double Dan, he’s the character in the darknet that makes a virus. He was described as looking like Spam that had been left on the floor. That was kind of our mission statement for him. The artist who did it just came up with this amazing sort of meaty, fleshy texture with these like little fat bubbles in it that, you know, I just had no idea it could be that- that disgusting, and also kind of really interesting to look at. I was really impressed with that. I think one of the other things someone did that, it was just their idea was the character Yes. She changes her hair a lot. One of the hairstyles she has, he’s running little, almost like fiber optic lights through her hair. And that was something he made up and everybody loved it. And so it made it in the move. Which is great. TCF: That’s one of the things I really appreciate about computer animation is the level of detail that can go in there. There’re so many people working on it, so everybody has something they can add. 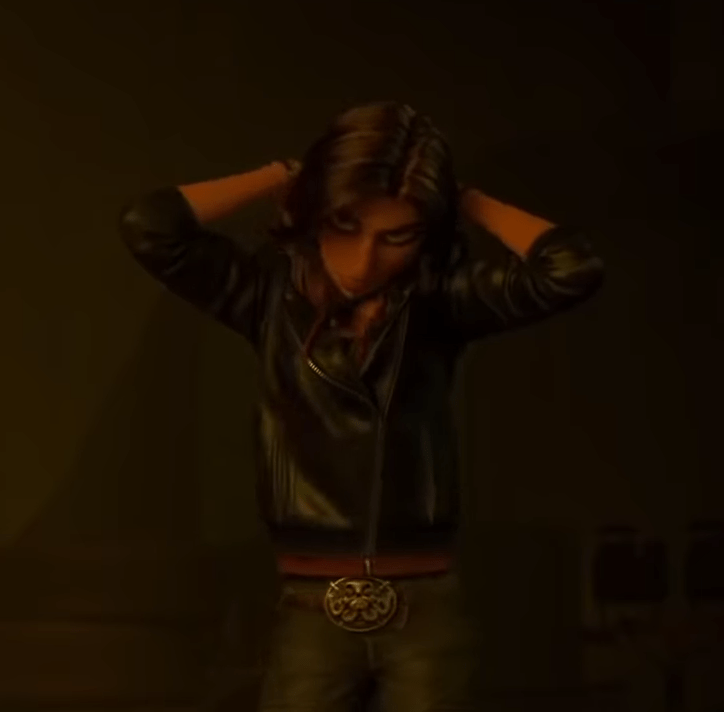 One thing I noticed in the movie and was curious if it was what I thought it was, Shank’s belt buckle, is that a Hydra symbol? I couldn’t tell if that was just some unique symbol or if it was another throwback to some of the different Disney properties. Michelle: Oh, right. No, it wasn’t specifically a throwback, it was something that Corey Lock has designed, I believe, or maybe it was Ami. But it was one of the art department folks. TCF: At what point does you and your team get involved on a project? How far along with the script and character development? Michelle: I’m on a project for about two years. We start kind of slowly, or usually with the main characters and then as we wrap up we do a whole lot of stuff. And then it kind of trickles down. For an average artist, they might be on the film for about a year. You kind of come on at the point where there’s been a few screenings and everyone’s starting to feel like we know who these characters are and we can start building them. But early enough that we can get ahead of actual shots going into production because we have to be done with a character before it can start being animated. TCF: You said there’s a few screenings already? Is that in-house with just like gray animatics kind of thing? Michelle: Right, yeah. Story sketches and rough layout and things like that. TCF: Have you ever had to work on a character that you loved and it got cut from the film? Michelle: Oh, many times. Many, many times. Every movie goes through a sort of process of story change and story revision and refinement. Often as a part of that process, we have to say goodbye to things that we might love but no longer support the direction of the story. So, yeah. There’s a little graveyard of lost characters. TCF: Do you have an example of one of these characters? Michelle: For Zootopia, there’s definitely one. In the earliest versions of the story, our main villain, the mayor, was originally supposed to be this female pig. And they were like, “eh, we think it needs to be this lion character.” So she’s in the movie, but she’s only there for one shot. She is the one who gets her picture taken at the DMV. She has a different outfit on, but that’s who she was. RALPH BREAKS THE INTERNET is in Theatres NOW!